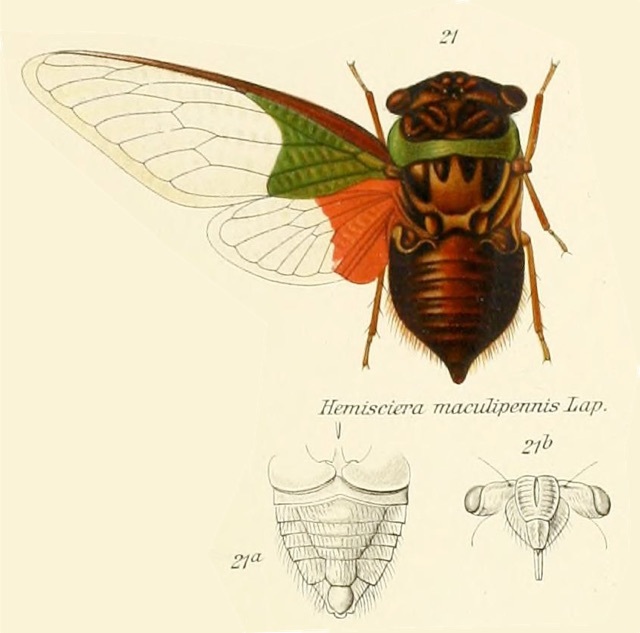 Majeorona aper (Walker, 1850) is a cicada found in Brazil, Colombia, Ecuador, French Guiana, Panama, and likely adjacent nations. 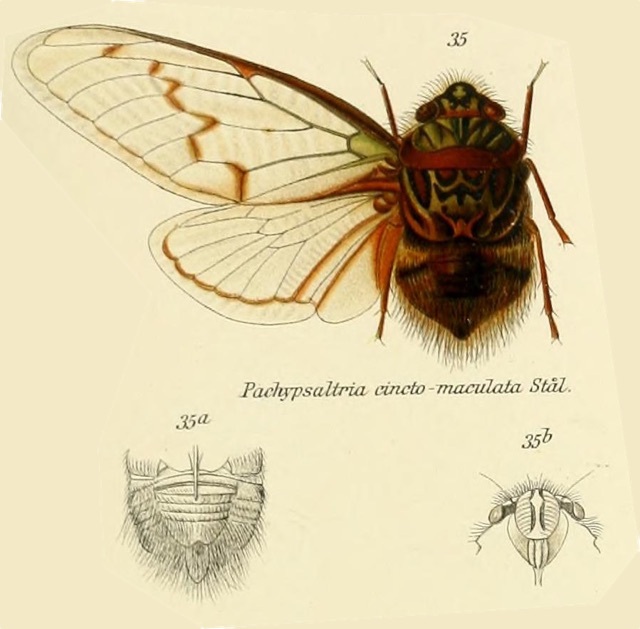 Pachypsaltria cinctomaculata (Stål, 1854) is found in Columbia, Bolivia, Ecuador, and Venuezela. Characters. — Head including eyes a little more than half the width of base of mesonotum, the front subconically produced, about as long as vertex, head obliquely depressed, eyes oblique, slightly passing the anterior pronotal angles; face moderately globose, not longitudinally sulcate; rostrum passing the posterior coxas; pronotum shorter than mesonotum, its posterior margin nearly twice as broad as anterior margin, the lateral margins dentately sinuate; mesonotum shorter than head and pronotum together, convex; abdomen short, about as long as head and pronotum together; tympanal orifices inwardly exposed; opercula short, broad, scarcely extending beyond base of abdomen: body pilose, marginally longly so; anterior femora not spined beneath; tegmina more than twice longer than broad, apical areas eight; wings with six apical areas. Pachy (Greek) means thick, and psalt comes from “psalter” (Greek), which means harp player. Pachypsaltria = thick harp player. I’m starting a new series on this blog called “has its name changed?” I’m looking through old documents and papers and using modern documents like Allen Sanborn’s Catalogue of the Cicadoidea (Hemiptera: Auchenorrhyncha) to check. 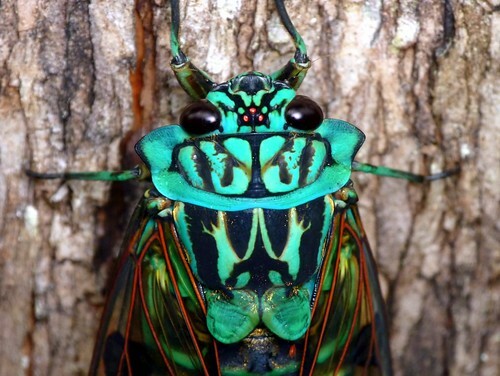 Cicada names change from time to time, based on new discoveries by the modern cicada research/science community, and sometimes to fix grammar (like gender agreement between genus and species). 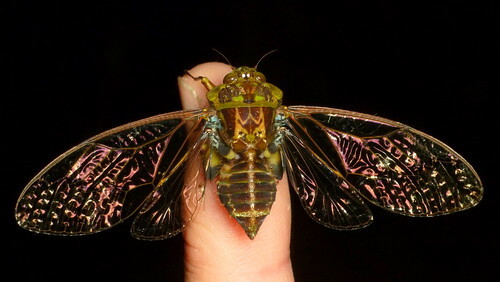 This cicada is Hemisciera maculipennis (de Laporte, 1832), also known as the “stop and go” or “stop light” cicada because of the red and green color of its wings. If you want to see one in real life, they exist in Central and South America, specifically Panama, Ecuador, Brazil, and adjacent nations. If you’re in New York and you want to see one, they have a few in the collection at the Staten Island Museum — last time I was there, there was a faded one in a display by the door (UV rays fade cicada specimen colors). And, since 1914 at least, its name has not changed. Characters. — Head (including eyes) considerably broader than base of mesonotum, eves porrect, more or less stylate, length of head about equal to half its breadth between eyes, and distinctly shorter than pronotum which is about equal in length to mesonotum; abdomen a little shorter than space between apex of head and base of cruciform elevation, tympanal coverings in male with their inner margins strongly concave; metasternal plate well developed, centrally longitudinally impressed and anteriorly produced on each side; rostrum reaching the posterior coxae; anterior femora strongly spined beneath; opercula in male small, transverse, not extending beyond base of abdomen, tegmina about two and a half times as long as broad, with eight apical areas and the basal cell about as long as broad. Zammara with a collar like Dracula! 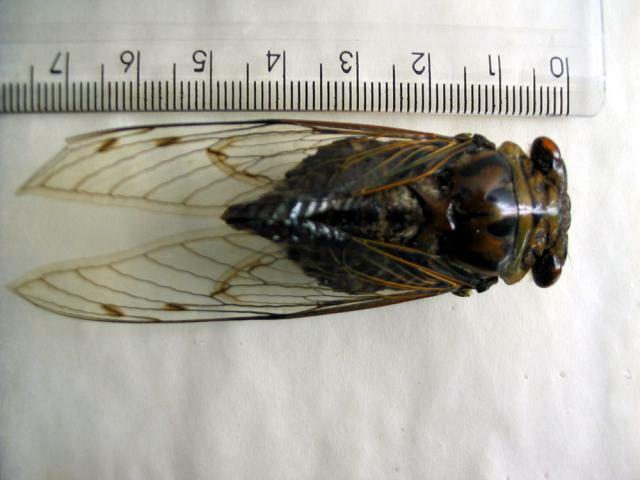 Just in time for Halloween… the Zammara a genus of cicadas with a collar like Dracula! Andreas Kay has been posting photos of the insects of Ecuador on Flickr for around a year now. 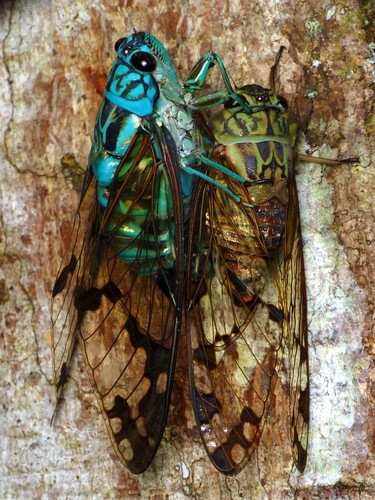 He’s posted many excellent cicada photos, particularly, photos of Zammara. 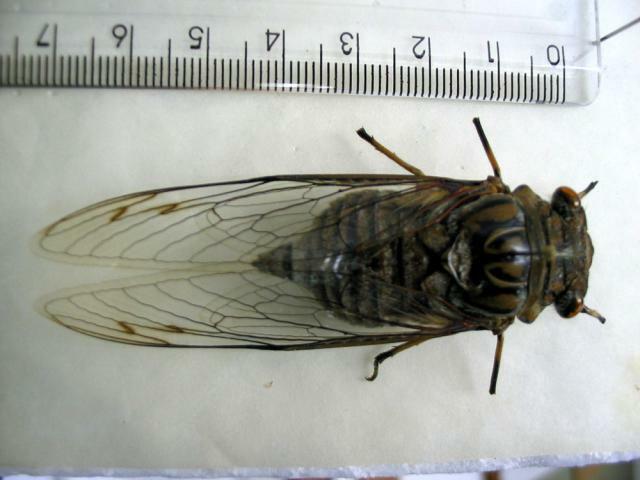 They are among the most visually interesting cicadas. Comments Off on Zammara with a collar like Dracula!